The Semovente 75/46 M43 is a Rank III Italy tank destroyer with a battle rating of 4.3 (AB/RB/SB). It was introduced in Update 1.85 "Supersonic". The Semovente 75/46 retains the improved armour of its 4.0 predecessor, with a 25mm slightly-angled frontal plate sitting in front of a flat 75mm plate and a driver's hatch on the left-hand side adding an additional 25mm of protection. This allows the Semovente's frontal armour to effectively provide up to 145mm of penetration when properly angled, or 170mm over the driver's hatch. For this reason. players should always look to angle the tanks' left side toward the enemy to allow the hatch to bounce shots more effectively. As a result, the Semoventes' armour can provide very effective protection against same or lower-rank tanks when properly angled. Ideally, the vehicle will look to use its extremely effective high-velocity gun to engage targets from a distance, where its small frontal profile and strong frontal armour make it difficult to penetrate. Enemy players will often fail to identify the tanks weak-spots and simply fire into the flat frontal plate, allowing the Semovente to bounce rounds effectively. The armour becomes much less effective in a full up-tier however, with Allied guns such as the British 17-pdr, US 76mm M1 and Soviet 85mm D-5T being able to reliably penetrate the vehicle at close range even when angled. The tanks' small size and cramped crew compartments also means that APHE shells offer little hope of survival should they get through its armour. As with most tank-destroyers, the vehicles' side and rear armour do little to protect it in case of a flank, and players should always look to keep their nose pointed toward the enemy. The Semovente has reasonable mobility for a tank destroyer, being able to hit and maintain around 37km/h when driving off-road on level ground. The vehicle has a slow reverse speed however, only being able to hit 4km/h in its single gear. 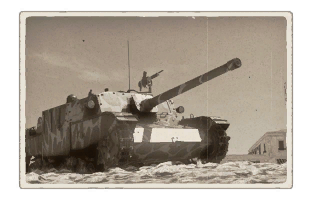 Despite its lack of neutral steering, the tank can traverse its hull reasonably quickly from a full stop, greatly helping to overcome its lack of a turret. The Semovente is usually most effective when remaining at a distance, where its powerful gun and strong frontal armour can do their best work. A player should ideally look to exploit the tanks' small frontal profile and reasonable mobility to get into strong position's on the enemies' flank. The 75mm gun's high velocity, good reload and post-penetration effectiveness make it ideal for attacking enemy tanks from the side, where it can easily penetrate their side armour even in a full up-tier. This normally represents the safest way to play the vehicle. Players can be considerably more aggressive when top-rank however. Most adversaries at 4.3 or below will struggle to stop the Semoventes' gun with their frontal armour, and the vehicles' fast traverse time and low profile can allow it to quickly take out an unaware enemy, even in close quarters. The most dangerous adversaries for the Semovente are either heavy tanks with extremely thick and angled armour, or vehicles with powerful APCBC shells that can defeat its frontal plate. Sherman Jumbos have the frontal armour to stop the Semoventes' gun, with their only weakspot being their machine gun port or their turret ring, both of which represent very small targets. A Jumbo in a hull-down position represents an incredibly difficult target for the Semovente, although its short-barrelled gun will have trouble penetrating the Italian tanks' frontal plate. Heavy Soviet tanks such as the KV-1 and the rarer IS-1 are also tough opponents for the Semovente, with the KV best shot through the turret cheeks or the machine-gun port when angled. While the IS-1 has a far better gun than either the KV-1 or the Jumbo, its vulnerable turret ring can allow the Semovente to bypass its extremely thick frontal armour. Powerful gun with effective penetration and post-penetration damage, high velocity and accuracy, and a decent reload. Skin and Camouflages for the 75/46 M43 in Warthunder Live.